ADORATION OF THE MAGI, attributed to Hieronymus Bosch,c. 1450- 1516, at Petworth House. The kings are presenting their gifts to the child. Post conservation. 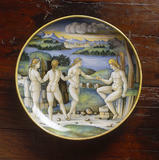 A close-up of a Maiolica dish, Castel Durante, c.1524-6 in the showcase in the Drawing Room at Polesden Lacey.